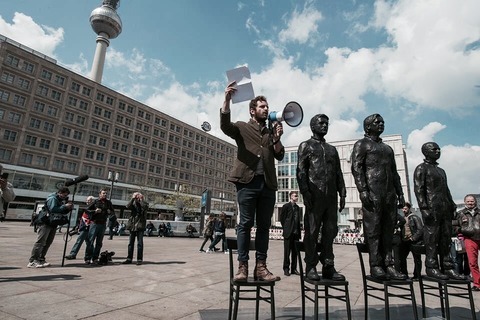 7 May 2015 – Bronze statues of persecuted whistleblowers Edward Snowden, Julian Assange and Bradley Manning were unveiled in Berlin on May Day. 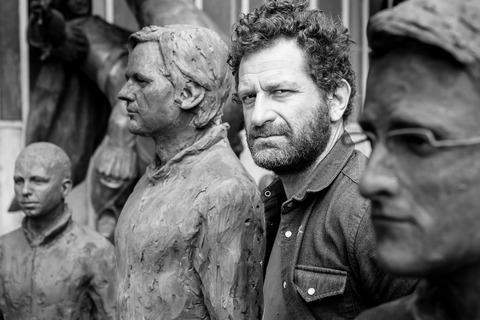 The statues are part of an art project entitled “Anything to Say?”, the work of Italian artist Davide Dormino, which pays tribute to the courage of the three. The life-size effigies of the trio stand in a row on chairs beside one extra empty chair. 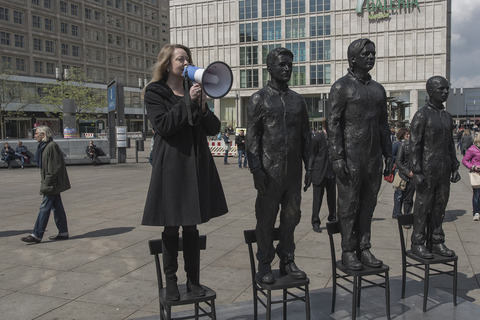 The extra chair invites passersby to express their solidarity with the three whistleblowers and share their own views publicly. Davide Dormino and his sculptures. 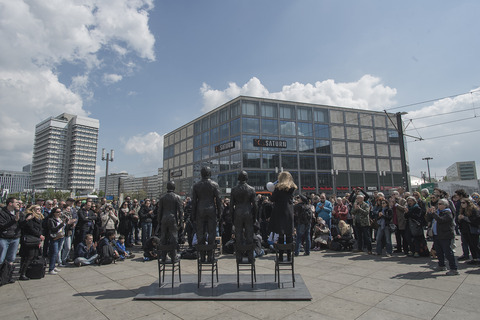 Hundreds of people gathered in Berlin’s Alexanderplatz on Friday, with many adults and also children mounting the chair to air their views to the assembled crowd. The WSWS spoke with Dormino, an artist who also teaches sculpture and drawing at the Rome University of Fine Arts (Libera Accademia di Belle Arti di Roma). Stefan Steinberg: What was your motivation for this project? Davide Dormino: I was speaking to my friend, the American author and journalist, Charles Glass, about courage and the importance of adopting a critical attitude toward authority, and gradually the concept for the project emerged. This has been an element in my art work for many years, in fact, from the very beginning. I am a firm advocate of public art. I believe that such art is a great chance to speak to a broad audience, and I believe art is a great opportunity to help people to mature and develop their ideas. I came up with the idea of three figures standing on chairs. Why the chairs? The chair has a double meaning. It can be something comfortable, but we can also use it to elevate ourselves and gain a new perspective. The idea was to represent three icons of our contemporary world, three men who defied the system. They chose the chair of courage … but the empty chair is the most important part of the sculpture. It is an opportunity for us to stand up, to get a better view and share their courageous stance. Perhaps you may remember the scene in the film, Dead Poets Society , where the pupils stand on the tables as an example of courage and the rejection of blind authority—I think we need such courage today. 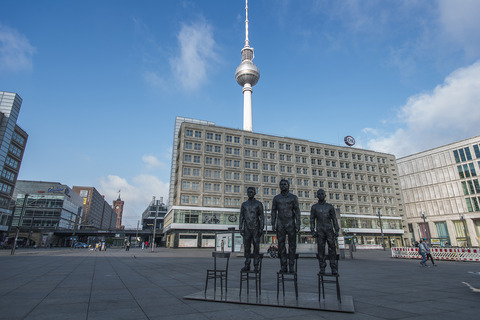 There was an amazing reaction in Berlin at Alexanderplatz. Everybody felt that it was an all-inclusive moment. Some people stood on chairs and expressed their support for the whistleblowers, some said nothing. It was very important. SS: Could you say some more about your conception of public art? DD: I am an independent artist. I work with galleries, but an integral part of my work is public art. In 2011 I did a work to commemorate the victims of the 2010 earthquake in Haiti, “Breath”. It was also a public art work, a monument to the many victims of the earthquake. Art is great when it gives people an opportunity to ask some questions about their lives and society. SS: There are many artists today who deny or play down art’s social role and are content to reduce art to mere decoration. DD: Art can do much more. The role of the artist is to help people to ask questions, encourage discussion and assist in developing new perspectives. SS: The individuals you’ve sculpted are vilified by political establishments all over the world. In various ways Edward Snowden, Julian Assange, and Bradley [Chelsea] Manning are all prisoners and have had to accept huge restrictions on their freedom. Why are they heroes for you? DD: They are heroes because they show us how much control governments have over us. We have to understand the difference between control and privacy. Privacy is sacrosanct. It is a basic human right. With the new technology it is easier for the government to control us. That is not democracy, in my opinion, but it is also important to know why and how they control us. We need to have the courage to know the truth. Sometimes people don’t understand and they say, “It doesn’t matter if they know everything about me.” This is very wrong. SS: In the past your work has taken a more abstract form, this time you have chosen a very direct, realistic form. DD: I deliberately chose to model them in a realistic fashion—an ancient form of representation. The message has to be clear. People have to be able to immediately recognize them. SS: What is the plan for the sculptures after Berlin? DD: The idea is to make a viral sculpture, a living sculpture that can be featured in the main squares of the most important cities of the world. To leave a sign, a flag, to create a meeting point to encourage dialogue and permit people to adopt a different point of view. To start discussions. After a month in Berlin, we will move the sculptures to the Ostrale art centre in Dresden. They have supported us. We are also working to organize exhibitions in America, Moscow, Switzerland, Portugal and other countries.